Alaska moose hunting may be one of the most exciting big game hunts on the planet. There is nothing like calling a big bull moose in close. Antlers swaying back and forth, cow moose calling, grunts, brush breaking and antlers crashing together, all sounds and sights not uncommon on an Alaskan moose hunt. All of Top Gun Treks guides are skilled in the art of calling moose. This gives the hunter a definite advantage on the hunt of a lifetime. Contact us to find out more. Our moose hunters will be transported to camps by airplane. From there we hunt by hiking out from camp, glassing for moose, calling, and stalking. All of our hunts are fair chase in non- motorized areas. 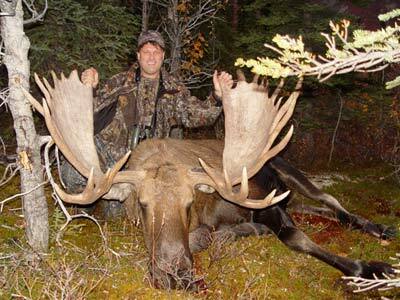 Over the last decade Top Gun Treks guided moose hunters experience success rates of over 90% successful. 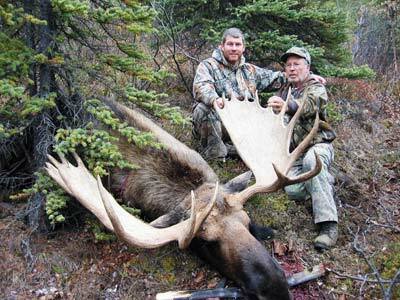 It is very common for hunters to see multiple legal bull moose (over 50 inches) in a 10 day hunt. Many of our hunters hunters have passed up multiple chances at other legal bulls before choosing the one they wanted. Of course it is hunting, and there variables we cannot control such as weather, but year in and year out our hunting areas have produced quality trophy animals. The country we hunt is majestic and beautiful. Long valleys, winding rivers, and crystal clear lakes fill the lanscape. It is definitely moose country, and big bulls can found anywhere from valley bottoms to mountain ridges. NOTE: We offer moose hunts units with some of the highest moose populations in the state of Alaska. The bull cow ratio is excellent and we limit the number of hunters in our area. Our hunters often have the opportunity to see multiple legal bulls on a 10 day hunt. Because we are hunting moose during the pre-rut and rut cycle we often have many close encounters with moose. We conduct moose hunts in remote non motorized areas only accessible by airplane. The country is beautiful and vast and hosts good populations of many Alaska big game animals including moose, grizzly bear, all sheep, caribou, and wolf. 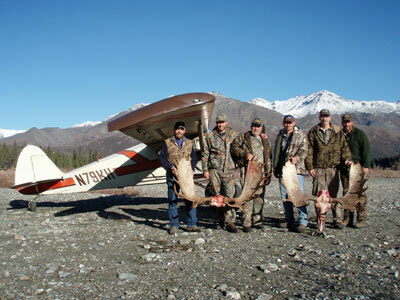 We begin our hunts at our base camp where we fly you by small bush plane to remote spike camps. From there all hunting is on foot.